Update 0.9.0 for Crossout, the post-apocalyptic crafting-and-combat Action MMO. It adds, among new features and other improvements, the seventh faction to the game - the Firestarters. 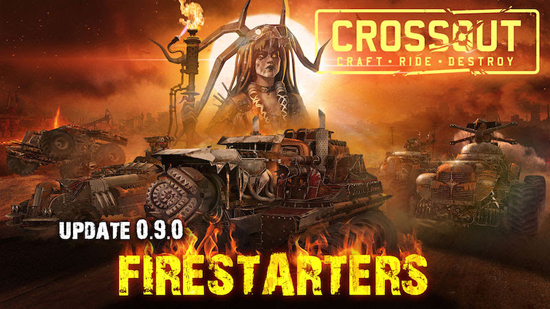 Players allying with this group of fire-worshipping madmen are rewarded with new vehicle parts that can turn any battlefield into a scorched wasteland: Incendiary bombs, a kamikaze cabin, and a “meat grinder turned wheels” are only some of the new parts available now. Set in a post-apocalyptic world, Crossout is an MMO vehicle combat game available on PC, PlayStation 4 and Xbox One, offering players complete customisation in building and upgrading deadly armored vehicles to destroy enemies in open PvP and PvE battles. 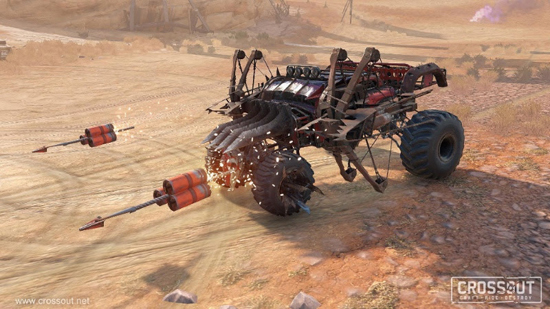 Crossout gives players thousands of possibilities to design their vehicle, including shape, armor, weapons, support systems and, of course, cosmetic enhancements.